Before we look at the markets, have you joined us in the Hurst Trading Room live webinars? They are a lot of fun, and the feedback has been that they are proving very useful, so please join us this Monday: register here. In my last post I discussed some possibilities for the August 2015 trough, including one particularly bearish possibility: that the 40-week cycle trough actually occurred in early July 2015, and the big drop in late August was a fall into a smaller cycle trough. I say it is obvious because that big drop in August was a move befitting an 18-month cycle plunge. Since then the market has produced a very neutral-shaped 40-day cycle, before springing up with enthusiasm into October. I have written before about the fact that we sometimes see a neutral-shaped short cycle preceding a strong move (see this post about the Euro in which I demonstrate an example in the Nasdaq 100). In this analysis price is bouncing out of the 20-day cycle trough after an 80-day cycle trough at the end of September. 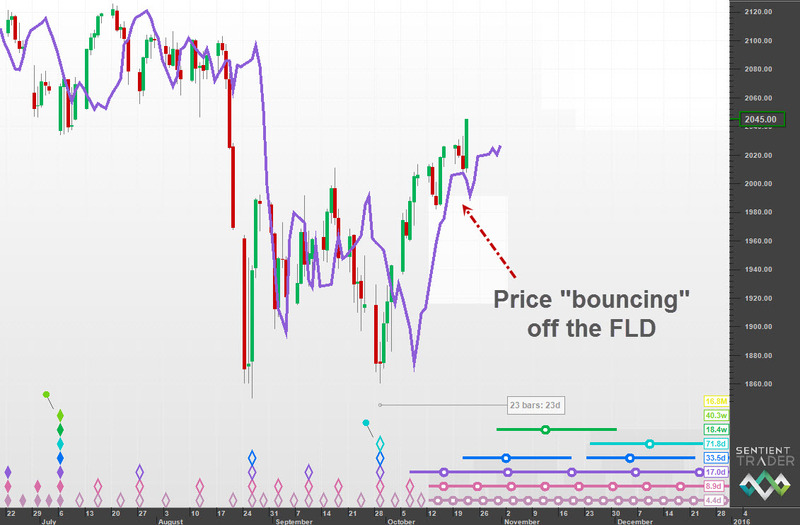 And at that point we expect price to find support at the level of the 20-day FLD. This interesting solution to the FLD problem does not guarantee that the above analysis is the correct one, but it definitely needs to be an option that we keep our eyes on. Because if it is correct this “big bounce” is only going to carry us to the peak of the 80-day cycle before we head down again, and probably head down with some speed. How possible is it that this is the correct analysis? The only big problem with the analysis is that the 40-day August trough is dropped below both of the 80-day troughs to each side of it (the early July and late September troughs). But in fact it was only slightly lower than the trough at the end of September, and that was for brief periods of time on the three days 24-26 August. After the very strong drop into 24 August there was a good deal of emotion and panic going around, and so I think we could give the markets a little leeway. What do you think? It is fairly confusing at the moment with several possible phasings all giving good probabilities. I do favour the last analysis at the moment (80 day low in late Sept) but looking at the Nasdaq price has already surpassed the proposed 40 week trough – so needs to come down VERY hard. In favour of this analysis is the interaction with the FLD so far as pointed out. What should bring more clarity is the next move down. It needs to come down hard into the 40 day, bounce weakly and then move down hard again to make a new low for the 20 week, in my view. I was trying to start a separate post but I cannot see if or how I could do that. I have been watching the videos after the fact and find myself not comfortable with any of the analyses presented. Spectrally they just don’t make sense. Now first let me say this is just another opinion and we cant really know which analysis is right and having alternates is always better than trying to stick to just one. 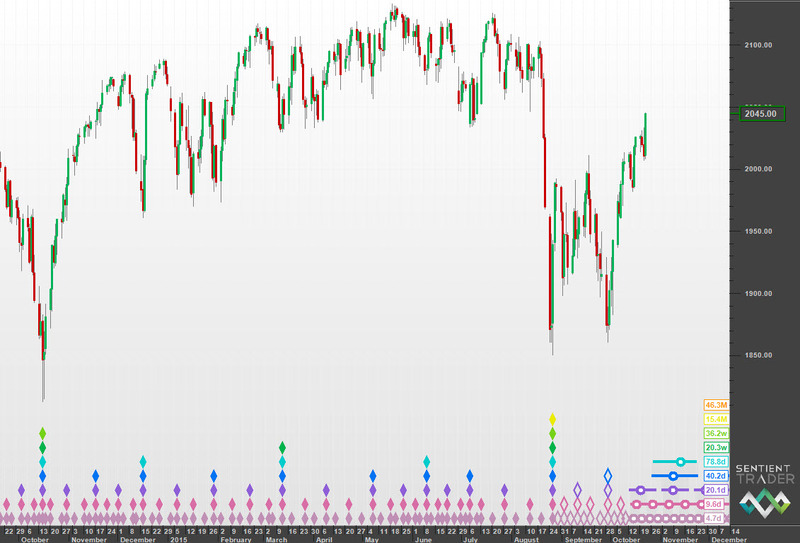 However, I believe Sentient Trader and cycle analysis in general are challenged by sharp moves such as the dive in August of this year while Spectral analysis is not “as challenged.” I am posting the longer term chart first which shows analysis beginning August 2007 so plenty of data and anchoring an obvious 54 month low in 03/2009. It uses David’s new composite line that I have been graciously allowed to beta test. I like this feature immensely! I had experimented with multiple analyses before stumbling onto this one but it seems to coordinate with successfully. This is a designer analysis influence by the spectral analysis work of William Randall. The main points of this being that October 2014 was a 40 week low and early February of 2015 was a 20 week low. This analysis suggests a low for the S&P 500 in the fall 2016-early spring 2017 time period near the peaks of the 2000 and 2007 highs around 1500-1600. In keeping with bull and bear market occurrences seems possible rather than a continued move higher. I certainly could be wrong as the only thing I know for certain is where we are right now. I will post a close up chart next with comments. Here is a follow up chart showing a pretty good tracking of the composite line with price. It suggests a mid-December peak 12/11-12/15? The falling into a 20 week low of about 180 points. it does suggest a slightly higher peak but that is certainly not guaranteed and I would say is not as likely as you can see peaks have been under performing composite levels by 20-60 points. This to me suggests that a test of the peak in May is possible but not much higher if that. Should it be lower that would also confirm that prices were likely headed into a higher magnitude low (54 Month) completing by late 2016/early 2017. Just another man’s humble opinion of what may occur. Peace, love and best wishes to you and your family’s. I am signed up to participate in this week’s webinar. It’s at 6:30 AM my time so lets see if I get to bed early enough. I am usaully the night owl at the computer into the wee hours of the morning. Here is a follow up chart showing a pretty good tracking of the composite line with price. It suggests a mid-December peak 12/11-12/15? The falling into a 20 week low of about 180 points. it does suggest a slightly higher peak but that is certainly not guaranteed and I would say is not as likely as you can see peaks have been under performing composite levels by 20-60 points. This to me suggests that a test of the peak in May is possible but not much higher if that. Should it be lower that would also confirm that prices were likely headed into a higher magnitude low (54 Month) completing by late 2016/early 2017. Just another man’s humble opinion of what may occur. Peace, love and best wishes to you and your family’s. I am signed up to participate in this week’s webinar. It’s at 6:30 AM my time so lets see if I get to bed early enough. I am usually the night owl at the computer into the wee hours of the morning. 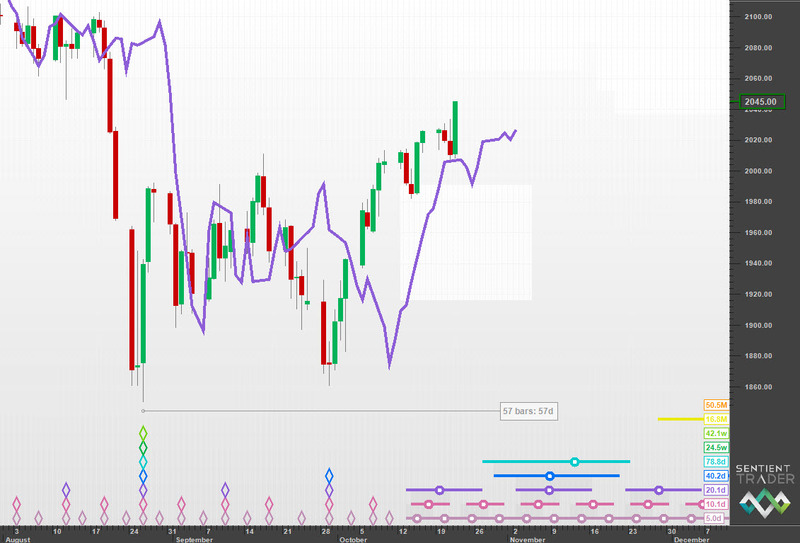 Hi Jeffrey, I have been tracking the same analysis you have above using the ICM for some weeks now on the US markets. The DJIA is particualy compelling. One aspect that I have to question though is that IF cycles are running using this shorter nominal model why is the most recent 80 day actually longer than the average nominal 80 day, even in the original Hurst model? 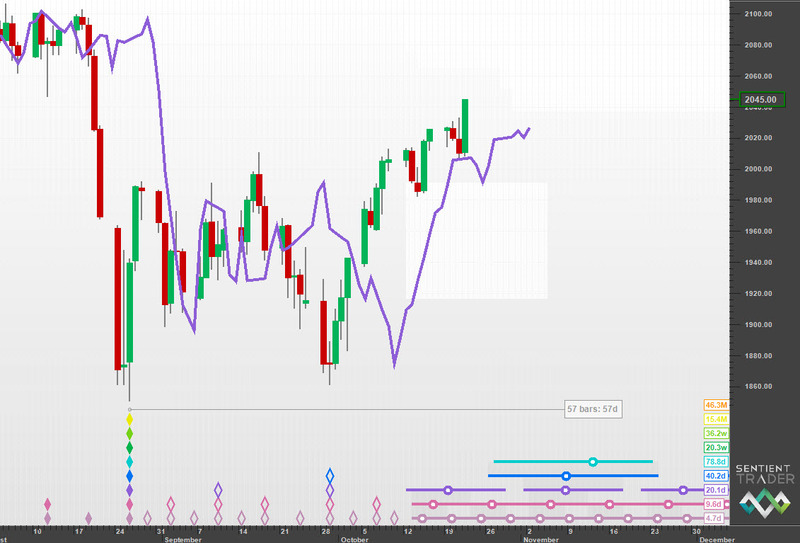 Im watching the 40 week FLD for resistance on the S&P.. The adherance to the composite line is compelling, although it is still in beta! See you in the webinar.